One of the treats at Maker Faire New York was watching kids playing Michael Newman‘s mechanical Video Sans-Video Game. 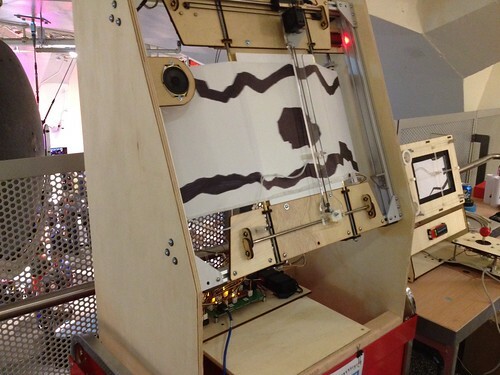 The play field is a scroll of paper with drawn-on caves and channels through which you must navigate (via joy-stick) your little paper space craft on an X-Y stage. If your craft collides with a wall or an asteroid, an infrared detector sees the darkened part of the paper, and it is game over! Michael brought two versions— a large arcade style one with a belt driven stage, and a smaller one modeled after the WaterColorBot cord and windlass system. One interesting thing about the young kids playing the game is that none of them had ever seen a media system that required rewinding to restart. Michael drew a new game Sunday morning to replace the slightly tattered roll after a full day of play at Maker Faire on Saturday. 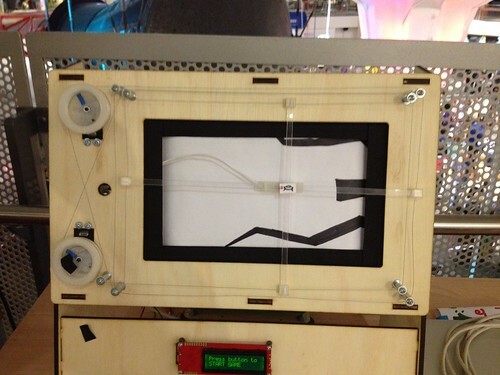 This entry was posted in Engineering and tagged art, games, makerfaire. Bookmark the Permalink. A video sans-video game. The name is absolutely inspiring, and it seems that the results are remarkable too! That’s amazing. I think I want one. Actually, I teach school and that would be a great introduction to electronics. A TV screen is so complex most students can’t really understand what is going on inside. Besides, it’s so elegant. Reminds me of a game one of my colleagues programmed in my apprenticeship. It had the same theme as this one and was programmed in C in DOS. I like the general idea and can relate to it, pretty cool stuff!